Testing molds in the tool room for water leaks is now made easy with Die-Sep's Water Leak Testers. The units are designed as either portable or mountable models. With either model, each circuit's inlet and discharge valves operate individually for checking one circuit at a time or all simultaneously. Additionally a circuit is provided to which a cam lock fitting can be attached to connect a hose to the mold's water manifold. Through the manifold, an entire mold half can be tested. The heavy duty, swivel casters make it easy to maneuver the portable unit around the shop. Fork truck channels make it easy to move the unit around the plant. Both models feature a pressure gauge, flow indicator and digital flow meter. So whether you're checking an entire mold anywhere in the plant or an individual circuit, Water Leak Testing is simple. Request a Quote for a Mold Water Leak Tester. For over 20 years, the Die-Sep has proven to be the quickest, easiest and safest way to open, tip and close molds in the tool rooms of injection mold plants worldwide. Our customers are global and include mold makers, and single and multiple injection mold plants around the world. Designed and patented by a tool room manager, the Die-Sep has developed from a simple separator using electromagnets to mount molds to a virtual tool room work site. Over the years we've added a tipper, one to six core pull accessories that allow you to hydraulically work cores, a table top, sprue bar offset, multiple zone hot temperature control units and a mold water leak tester. Each Die-Sep is custom built and handles molds from about 300 pounds to 70,000 pounds. Actually, the largest we've built so far will separate molds up to 70,000 pounds in less than two minutes. Our largest tipper will tip molds or mold halves up to 50,000 pounds. Our engineer continues to push the envelope with our next goal of opening and tipping molds of 100,000 pounds. 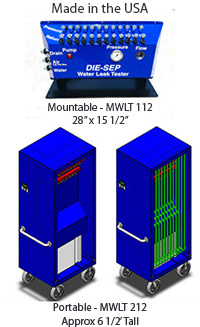 Request a quote for Mold Separator and Tipper.